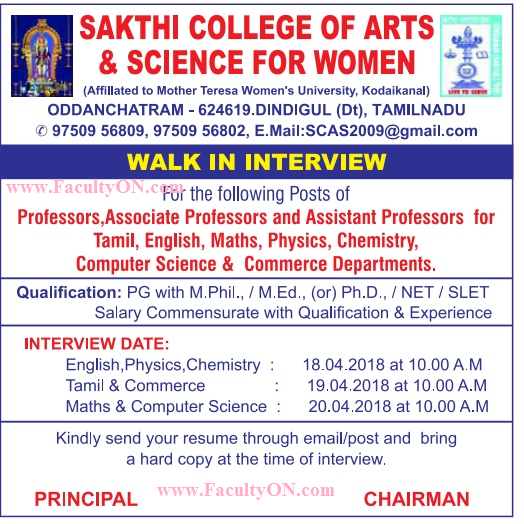 Sakthi College of Arts and Science for Women, Dindigul has advertised in the EENADU newspaper for recruitment of Professor / Associate Professor / Assistant Professor jobs vacancies. Interested and eligible job aspirants are requested to walk-in on 18th, 19th and 20th April 2018. Check out further more details below. About College: Sakthi College of Arts and Science for Women is a part of the Sakthi Group of Educational Institutions and is located in Sakthi Nagar. Bachelor of Arts (B.A.) in English, Bachelor of Commerce (B.Com.) and B.Com. with C.A., Bachelor of Business Management (BBM), Bachelor of Computer Applications (BCA), Bachelor of Science (B.Sc.) in Computer Science, Bachelor or Science in Maths (B.Sc. with C.A. ), Bachelor of Science (B.Sc.) in Physics and Bachelor of Science (B.Sc.) in Chemistry are the courses offered in this College. H.S.C. pass, with 50% marks in related subjects, is the eligibility criterion. How to Apply: Interested candidates are requested to send their CV, copies of certificates and recent PP size photo to the postal address or email address provided below and then attend the interview by bringing original certificates.